Why do some mushrooms have a heavenly taste while others are deadly poisonous? The mushroom, a gourmet food and a silent killer, is an angel with two faces. In nature, mushrooms rely on various ways to protect and disperse their offspring, spores. To fend off harmful insects and other animals, some mushrooms have found poisons and toxins extremely useful, as have plants. However, it is in fact quite difficult to make effective toxins as it often requires many genes that are hard to make from scratch. The most deadly mushroom, Amanita, along with almost equally poisonous Lepiota and Galerina, account for vast majority of deadly mushroom poisonings. Starting more than one hundred years ago, many have wondered why these unrelated mushrooms can produce the exact same lethal toxin, α-amanitin. A group of scientists at The Key Laboratory for Plant Diversity and Biogeography of East Asia, Kunming Institute of Botany, Chinese Academy of Sciences (KIB/CAS) recently found something surprising regarding this topic. LUO Hong, associate professor and the first author of the report explained, “These mushrooms did not make the toxin from scratch, they borrowed the genes from an unrelated ancient mushroom.” The borrowing process is called “horizontal gene transfer”, through which genes or DNA can be directly transferred among organisms, related or not. One example is that human genome is full of DNA from viruses, also a result of horizontal gene transfer. What is the benefit of the process? These mushrooms acquired highly useful genes from others instantly! Otherwise it may require tens of thousands of years to for them to make these genes from scratch. 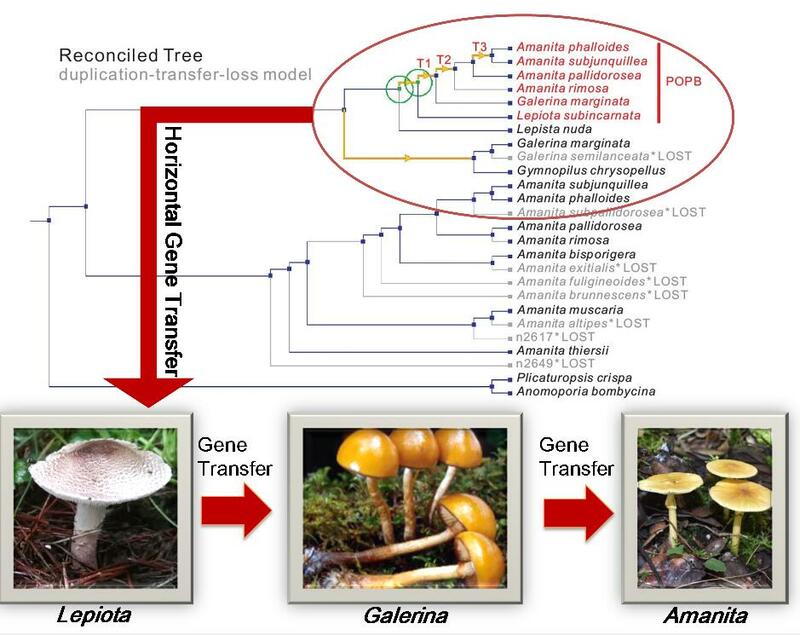 The report further denoted that, the rough sequence of the horizontal gene transfer is likely from Lepiota to Galerina, then to Amanita. Although Amanita was the last to acquire the genes, it expanded and perfected the toxin production, allowing it to make many more toxins. This has eventually made Amanita the king of the poisonous mushrooms. The report was entitled “The MSDIN family in amanitin-producing mushrooms and evolution of the prolyl oligopeptidase genes published in IMA Fungus 9(2): 225–242. Supporting funding include Strategic Priority Research Program of the Chinese Academy of Sciences (Grant no. XDB31000000), Natural Science Foundation of China (Grant no. 31772377), Scientific Research Foundation of the Education Department of Human Resources and Social Security of Yunnan Province, China, and Scientific Research Foundation of KIB/CAS.